Do you know where you’re going to? 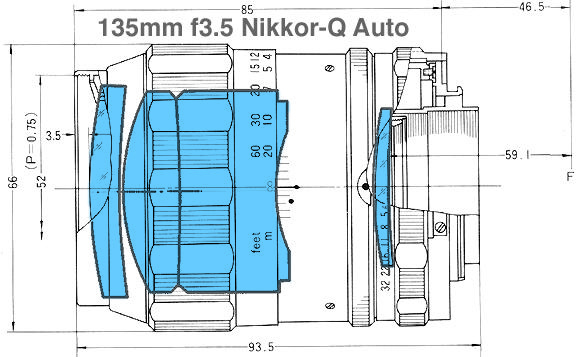 Optical Design of 135mm f/3.5 Nikkor-Q overlaid within the mechanism parts. Diagram should aid the discussions below. Disclaimer: all information in this blog is meant for sharing of experience and not as instruction, and is no substitute for diligent learning and assessment of competence. I have messed up my fair share of lenses, and will not be held responsible for the reader’s venture into this fascinating world of mechanical and optical marvel. Photos of the lenses in this discussion are at the end of the post, if you are not familiar with them do peruse the photos. In this post I will be exploring how a lens is constructed in general, with the idea that a better understanding of the internal workings of a lens can help in accessing the various components for maintenance. Conventions: lens is pointing to the left, mount to the right. We will “build” our lens from inside out, i.e. from the optical unit until we have the entire lens setup. As the title implies, this will be about the major parts of the lens, and will skim over details. This is to aid understanding of the lens, not a detailed discourse of disassembly of a lens. Optical Unit (OU) – this is where the lens elements are placed. Its basic functions: (i) hold the lens elements in their intended place; (ii) move as required when user focuses or zooms the lens. In a prime lens frequently houses the Aperture Unit (AU) as well. Aperture Unit (AU) – (i) houses the aperture mechanism; (ii) communicates with Aperture Ring (AR), sets aperture accordingly; and (iii) stops down the lens when shutter is released. Helicoid Unit (HU) – moves the OU when user turns focusing ring or zooms. Clearly the OU must somehow be fixed to the helicoid. Comes in pairs, at least, for each function. When the filter ring moves (e.g. in a zoom lens), there is one pair of helicoid coupling with the focusing ring. When the filter ring does not move, the focusing helicoid has 2 pairs. For a zoom lens, there is another set of helicoid to cause the movement of the OUs while zooming (sometimes it pushes one OU forward while pushing another OU backwards). The Optical Unit for 135mm f/3.5 Nikkor-Q. Not shown in this photo – aperture coupling and stop-down coupling. The Helicoid Unit for 35mm f/2.8 Ai. Its OU Guide Pin goes into the slot at the front. When focusing ring turns, the helicoid moves the OU forwards or backwards. Focusing helicoid of a zoom lens (36-72mm f/3.5 E). Focusing Ring locks into the front part of this combined OU/HU. When the focusing ring is turned, the OU moves forward based on the thread – which defines the “throw” of the lens. And that’s why filter ring of most zoom lenses turns when focusing – annoying but reduces the complexity of construction by quite a bit. Zoom helicoid of the 36-72mm f/3.5 E – comprising 3 parts – front zoom tube, zoom helicoid (hidden), and zoom ring (visible ring with curved grooves). The front zoom tube (fully extended here) couples with the zoom action (push-pull in this case). While pushing forward (towards 36mm) the guide rollers move along the curved grooves, one set moving forward (long grooves), the other moving backwards (short grooves). While the front OU moves forward and the Mid OU/Aperture Unit/Rear OU moves backwards. The Chrome Grip and Depth-of-Field (DOF) Tube – sometimes this is one piece, sometimes two pieces. This is where the main structure of the lens is fixed. Focusing Ring – fixes to the HU to transfer the turning movement to axial movement of the OU. Filter Ring – hides the screws of the FR and allows use of filters. Name plate – usually is fixed to the Filter Ring (there are many exceptions). Focusing Ring and the Grip/DOF tube attaching to the helicoid unit. 135mm f/3.5 Nikkor-Q Auto Nikon. Optical Unit fits into the Helicoid Unit, with Focusing Ring (FR) and Grip/DOF already attached. The front ring is the Filter Ring. 35mm f/2.8 Ai. Note: there is another way of constructing a prime lens helicoid, where the OU/HU are integrated. For example in the 50mm f/1.8 AiS. I have not disassembled this lens fully and do not have photograph to show. But you can see what Richard Haw did in his excellent detailed post for 50mm f/1.8 AiS. And photo below from that post. Image courtesy of Richard Haw. See how the OU/HU are integrated. And interacts with inner focusing helicoid (above the OU/HU), and the outer focusing helicoid would interact with the grip inner helicoid. Rounding up would be the aperture ring and the rear bayonet mount. Aperture Ring – sets the aperture value, and transit this to the camera (non-Ai via prong, Ai via the ridge at the rear of the mount), to the Aperture Unit via some groove that moves a pin (or a screw that moves a groove, or…). Bayonet mount – locks the lens to the camera, (usually) housing the stop-down mechanism. Sometimes just a hole to allow the stop-down mechanism to go through. Aperture ring. Groove moves a pin that moves the aperture setting in the Aperture Unit. 35mm f/2.8 K.
Bayonet mount and stop-down mechanism. 50mm f/1.8 AiS (Japanese Domestic Version). There you have it, major parts of a prime lens! Nikon 35mm f/2.8 Ai/K. From top left (clockwise): Name Plate and Cover Ring, Filter Ring and Rubber Grip, Aperture Ring, Bayonet Mount (with screws), Chrome Grip and DOF combined (with screws), Optical Unit, Helicoid Unit (with screws), Focusing Ring (with screws). And the major parts of a zoom lens. Nikon Lens Series E 36-72mm f/3.5. From top left first row: focusing ring / rubber grip, FOU/HU integrated, shim, focusing collar (yes this and many Zoom-Nikkors have a focusing ring and a focusing collar! ), rear cap. Second row: DOF/index tube, aperture coupling ring, shims, bayonet mount, aperture ring with ROU, bayonet plate (2-piece bayonet mount). Third row: front zoom tube, MOU/AU, zoom helicoid, shims, chrome grip. Bottom: lens cap, zoom ring. I bet you are itching to go… please read disclaimer… lens disassembly not yet covered… go read Richard Haw’s Classic Nikon Maintenance Site and good luck on your adventure. Remember you may have to pay “tuition fee” in the form of ruined lenses..
More to come in the coming parts… enjoy your “Lego” set. 135mm f/3.5 Nikkor-Q Auto Nikon. Price (about US$5) reflected the conditions of the lens (junk) with badly scratched front element and stuck helicoid. Nikon Lens Series E 36-72mm f/3.5. Zoom set at 36mm. 50mm f/1.8 AiS Japanese Domestic version.